pursuing your full growth and earning potentials. So much more than the competition! For more than 10 years, Our Customers have looked to Business Basics as a trusted developer of lean management tutorials, seminars, courses and training materials. Training options that help improve the spirit and performance of individuals, teams, organizations and companies. "Thank Bill for the "Free-be". I can already see where I can apply much of it to my office operation. By the way, I did not just buy the "Thinking outside the Box" program I bought the "Performance Measurement Training Package" of which "Thinking Out-side the Box" was part of. The total program has been reviewed and re-reviewed many times already and many parts used to train some of my staff. Thanks for a great product." Thinking-Outside-the-Box e-Book: What and Why? Thinking-Outside-the-Box refers to the capacity of individuals and businesses to see any situation from fresh and new perspectives. Moreover, it refers to the capacity of individuals and business to act highly effectively on these fresh and new perspectives. Thinking-Outside-the-Box continuously requires individuals and businesses to challenge and expand their way of thinking. Thinking-Outside-the-Box provides ways to generate and implement innovative ideas and solutions to address difficult (and even not so difficult) situations. This is what sets us apart from our peers in today's extremely demanding way of life. Thinking-Outside-the-Box is not a luxury, it is a necessity! Thinking-Outside-the-Box can be used to ensure optimal effectiveness in Decision Making, Problem Solving, Strategic Planning, Personal Growth, New Product Development, Conflict Resolution to Artistic Inspiration to name but a few. In effect, it can be used for every conceivable (and inconceivable) situation. The reality is that everybody can cultivate and improve their Thinking-Outside- the-Box skills. If you've ever said, there must be a better way... there is! Do you want to optimize personal and company success? If so... you need to identify and master the basics of thinking-outside-the-box.. Many historic, recurring day-to-day problems (perhaps the same problems that plague your operation) can be permanently eliminated by a tenacious execution of new ideas generated by this Thinking-Outside-the-Box Training Package. Thinking-Outside-the-Box skills are greatly required by everybody. Each and everybody need to continuously challenge and expand their ways of thinking to enhance personal and business effectiveness. Moreover, each and everybody needs to be able to optimally act on their expanded ways of thinking to enhance personal and business effectiveness. However, the truth is that not too many people can say that they are truly Thinking-Outside-the-Box as a way of life. The good news is that Thinking-out- of-the-Box is something that can be exercised and improved. The principles presented by the Thinking-Outside-the-Box e-Book are so fundamental that it is applicable to each and every person, whether in an organization or an individual setting. "I know of no more encouraging fact than the unquestionable ability of man to elevate his life by a conscious endeavor"
"People are always blaming circumstances for what they are. I don't believe in circumstances. The people who get on in this world are the people who get up and look for the circumstances they want, and if they can't find them, make them"
Each and everybody that wants to live optimally, need to challenge existing concepts and perceptions by applying Thinking-Outside-the-Box principles. We realistically acknowledge that this training package is not the only way to become a more effective and creative person by optimally Thinking-Outside- the-Box. There are other ways to improve one's Thinking-Outside-the-Box skills as well. For example: You could read books on the topic to get a better understanding and insight, or you could attend a offsite e-Book, or you could learn from colleagues and/or friends who are proficient thinkers, amongst others. All these options have merit and are worthwhile. Moreover, these options do not need to be mutually exclusive. For example, you could do all or any combination of the mentioned options (or you could even do options that have not been mentioned!) to become a more proficient and creative thinker. It is proven: It encapsulates time-tested principles that produce powerful results. It is effective: It can be done at your own convenient time and you do not need to take time off from work. It is affordable: It is a very cost effective and affordable way to improve your Thinking-Outside-the-Box skills. It is accessible: It can be used whenever required at the "touch of a button" as a learning aid or refresher. It is practical: It provides a Thinking-Outside-the-Box toolbox, which provides you with techniques and guidelines to apply your Thinking-Outside-the-Box skills. Purchasing the training package is completely risk free: we provide a full no questions asked, money back guarantee. Reach your full growth and earnings potential. "This e-e-Book is fantastic, a real-world, presentation on how to stimulate creative thinking and transform it into effective problem solving. It can transform visions into reality and its contribution to a company's bottom line will be significant. I guarantee it!" �The first topic explains Why Thinking-out-of-the-Box is required. It is very important to understand Why Thinking-out-of-the-Box is required. Understanding why Thinking-out-of-the-Box is required provides compelling motivation for actually using the Thinking-out-of-the-Box techniques. 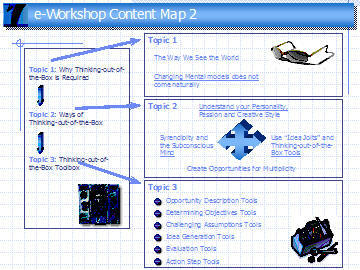 �The second topic discusses different ways to Thinking-out-of-the-Box. Thinking-out-of-the-Box involves a number of synergistic aspects, which are all required for optimal effectiveness. The most optimal Thinking-out-of-the-Box results would be achieved when all four of these aspects are jointly integrated into our daily living. Firstly, it is very important to understand our own personality, passion and creative style. If we understand and align our lives with our personality, passion and creative style, we optimize our ability to Think-out-of-the-Box. Secondly, we need ways to overcome the limits in the way our mind functions. We need to overcome the established patterns in our minds. This is achieved with the use of idea hooks or idea Jolts, as we call it. Thirdly, we need to realize that by combining concepts and ideas from different cultures and disciplines, we can multiply our creativity and dramatically enhance our Thinking-out-of-the-Box results. Fourthly, we should never underestimate the power of our subconscious mind, which keeps on solving problems, without us even being aware of this. You have probably experienced those a-ha! moments, when, for example, you are sitting in the bath and a solution pops up in your mind to a problem that you were not even thinking of at the time. �The third topic provides a toolbox, which would assist us to continuously Think-out-of-the-Box on a daily basis. It ensures that we effectively apply the things that we have learned about optimally Thinking-out-of-the-Box. The Thinking-out-of-the-Box �tools� is a set of steps, ideas and guidelines that could be followed to expand and challenge our existing thinking. Individually, and as a group, we need to be able to optimally Think-out-of-the-Box. 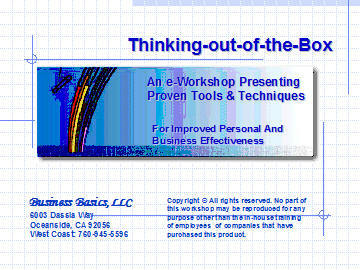 The Thinking-out-of-the-Box toolbox in this e-e-Book contains tools for both individuals and for groups. More often than not, these tools are common sense, and not �exotic�, so to speak. It provides powerful ways for us to see any situation from fresh and new perspectives. Moreover, it provides powerful ways for us to act highly effectively on these fresh and new perspectives. Most educational materials today are either Adobe .pdf e-books with little or no effective graphics or they're PowerPoint presentations with no commentary to explain the contents of the .ppt slides. Your work-shop on the other hand include 326-powerful, PowerPoint graphics, "plus" annotated note pages with slide commentary and "lessons learned" by a "been there, done that" professional. A value added, learning experience on "how to" develop and master creative thinking skills. We are so sure that your Thinking-Outside-the-Box e-Book will have the impact you desire that you can order entirely at our risk. The work-shop comes with a No Risk, 100% Unconditional Money-Back Guarantee. This is a Lifetime 100% Money- Back Guarantee! Believe this, we will never consider your purchase binding until you have reviewed all the material and put it into practice. We know that you, like our other customers, will be thrilled with the results. In fact, we are so convinced that this e-Book will work for you that if you aren't completely satisfied for any reason at any time, simply return it for an immediate refund of your purchase price. You simply can't lose. Remember, if you continue to work the same way, you're going to get the same results. The next move is up to you. I've shown you that our training package is as risk free as an offer can come. You and I know that if you've read this far, you're seriously interested in bringing sanity to your day-to-day work environment and helping yourself and your company achieve their full growth and earning potentials. Gain recognition, promotions, and salary increases. You may ask... what's in it for my company?